22-year-old Taylor Hendricks of Whitehall, Pa., (left) was arrested after allegedly punching a police horse outside of Lincoln Financial Field on Saturday ahead of the Falcons-Eagles playoff game. 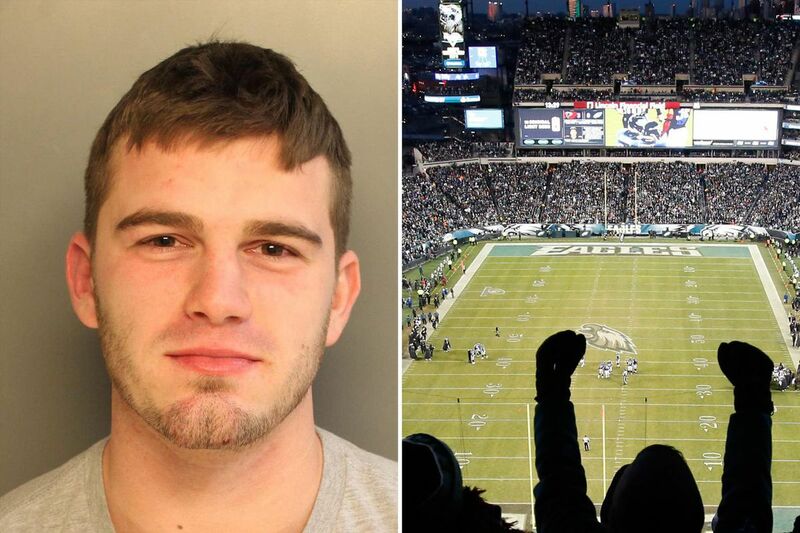 A 22-year-old Eagles fan has been arrested after allegedly punching a police horse outside Lincoln Financial Field on Saturday ahead of the Eagles' divisional playoff game against the Falcons. According to police, 22-year-old Taylor Hendricks, of Whitehall in Lehigh County, showed up to watch the highly-anticipated playoff game, but was ejected by the team because he was intoxicated and didn't have a ticket. Once he was ejected, authorities said, Hendricks walked over to a mounted police officer and began repeatedly punching the officer's horse, striking the animal in the face, neck and shoulder. He also allegedly struck the officer in the legs. Another officer rushed over and arrested Hendricks. Hendricks was charged with aggravated assault, taunting a police animal, simple assault and defiant trespass. He was released Sunday after posting 10 percent of $5,000 bail, according to court records. A preliminary hearing has been set for Jan. 30. The Eagles defeated the Falcons, 15-10, to set up Sunday's match-up against the Minnesota Vikings, with the NFC title and a trip to the Super Bowl on the line. Sunday's game starts at 6:40 p.m. and will take place at the Linc. Angry fans arrested in or around football games has previously happened this season. A 26-year-old Charlotte man was arrested after being caught sucker-punching a 62-year-old man during a Thursday night Eagles game against the Carolina Panthers in Charlotte. Kyle Adam Maraghy pleaded guilty to simple assault last month, WBTV reported. He was sentenced to 45 days in jail, which was suspended pending successful completion of 18 months of supervised probation.